I Will Go is the third release from the Abbotsford, British Columbia, rockers, adding momentum to six years of success. 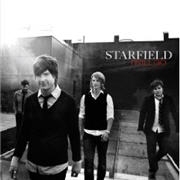 This record will be devoured in huge gulps by Starfield’s legions of loyal fans. I Will Go is the third release from the Abbotsford, British Columbia, rockers, adding momentum to six years of busy touring, successful sales, radio play and awards including a Juno, an armload of Covenants and special Gospel Music Association Dove recognition for their international success. The new CD is a collection of driving modern worship songs, like a lighter version of Hillsong United. In fact, the album’s first song is a cover of Hillsong’s “Hosanna,” one of several strong anthems ideal for corporate worship. Other notable tracks include “Reign in Us” and “Great in All the Earth” – singable, repetitive and suitably contagious. The vocals are excellent, with Tim and Jon Neufeld offering the same great sibling harmony that has become their signature. The writing is good, although perhaps not as innovative as Beauty in the Broken, their highly successful previous release. I really like this CD’s clear focus on global missions. It’s easy to feel the band’s authentic desire to shake up apathetic young people, urging them to get out of their comfort zones and reach out to a broken world with compassion. The CD was excellently recorded in both Nashville and Abbotsford by two stellar producers, Allen Salmon and Ed Cash.